More than once, I wish I had bought property in the Fountain Square section of Indianapolis back in the late nineties. First, then I’d have a house that I would have been molding into the perfect Geek Cave for the last decade and a half, but then I’d also be close to Fountain Square, which is home to great music venues, outstanding restaurants, and cool shops like Hero House Comics. Hero House Comics is a cool little comic book shop on E. Prospect, right smack dab in the middle of everything. Walking in, it’s well-stocked, open, and inviting. It’s located in an older building, so it retains a bit of that feel and charm. When you walk in the front door, you are greeted by an open space with t-shirts and art hanging around the store, long boxes of back issues down the center, with the walls stocked full of comics, books, graphic novels, and toys. 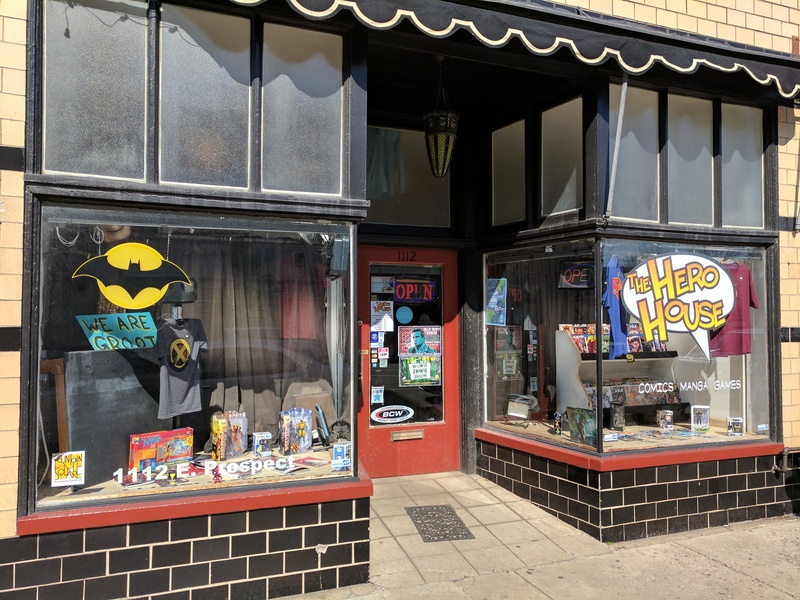 Hero House has everything you’d expect in a comic shop, like new releases, an All Ages section, a section of graphic novels, and toys from various licensed properties. In addition, they have some cool extras, like buttons and a good selection of books from Indy’s talented group of local creators! When Lizz and I walked in on a Saturday a few weeks ago, it was pretty slow. It was still pretty early in the day, after all, on a weekend. Mike (the owner) greeted us when we walked in and made sure we were doing okay before he got back to work on his organizing. We walked around for a bit, looking over comics, browsing the novels, and I observed as a few people came in. Mike was friendly with everyone, helping answer questions and grabbing pull lists for his steady customers. We chatted a bit about the shop’s GoFundMe Campaign, Five Year Mission, and just generally stuff around the store, and he’s just a really nice guy. 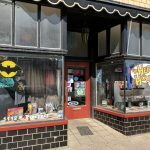 The store is currently trying to raise money to take care of some rough past few months in sales, so they are holding a GoFundMe, as well as asking people to remember their local comic shop over Amazon (which, as you know, I’m a fan of!). All this is going on while his band is getting ready to start work on their new “Year Four” album, in their quest to write music covering every episode of the original series of Star Trek. Even with all this, he’s pretty upbeat and always happy to help people in his shop, and talk about his music. What is their parking situation? There is street parking along most of Fountain Square, and there is also a lot behind the store. Just kidding on the phone number. Internet! Where are they online? You can see what’s happening on their Facebook page. I will be sure to visit during Gen Con! Or maybe at Who’s YerCon? Any idea if they will they be vending at WYC?